In part one I talked about three things that Path of Exile does differently – and in my opinion much better – than other ARPGs I’ve played. Was there any doubt that this would make the list? 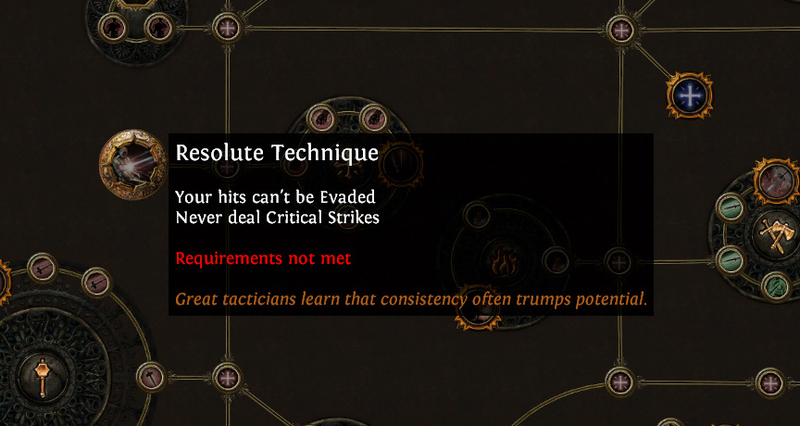 Since characters in PoE get all their active skills from gems socketed into their weapons and armor, skill points gained by leveling can be spent in a tree that ‘only’ contains passive abilities and bonuses. 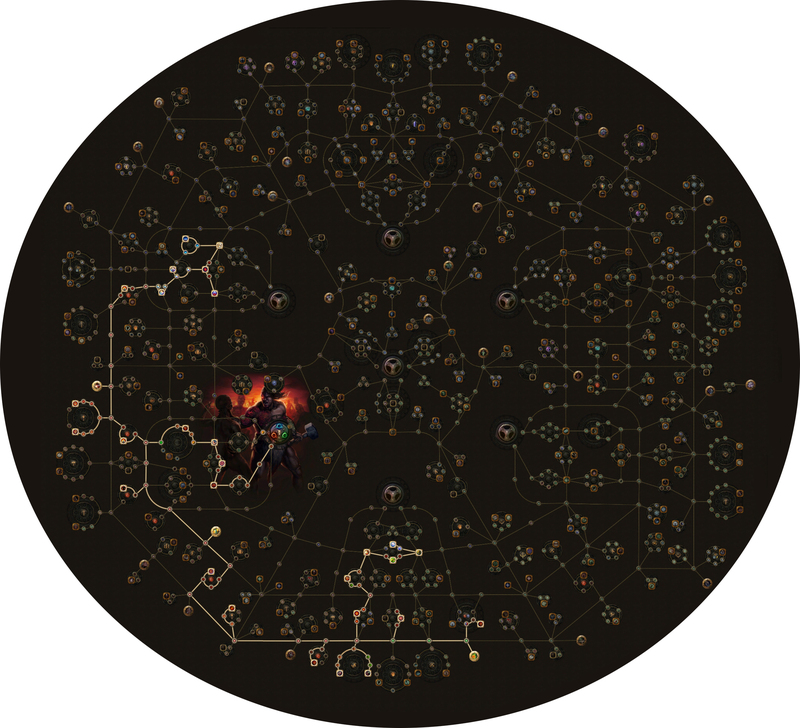 There isn’t an individual passive tree for each class either, instead there’s one massive tree for all classes, the only difference being the starting point. According to Lakisa it’s comparable to Final Fantasy X’s Sphere Grid. With each level-up one skill point is gained, some quests reward additional points. As of now the maximum amount a level 100 character can have is 123. This tree gives enormous flexibility to build the character of choice. While it’s not quite possible to play any conceivable build with any class (because even with 123 available points it’s not really viable to reach, say, the top left section of the tree with a Ranger, who starts on the bottom right hand side), but it’s pretty close. The tree has a hierarchy of nodes consisting of attribute nodes, basic nodes, Notables and Keystones. 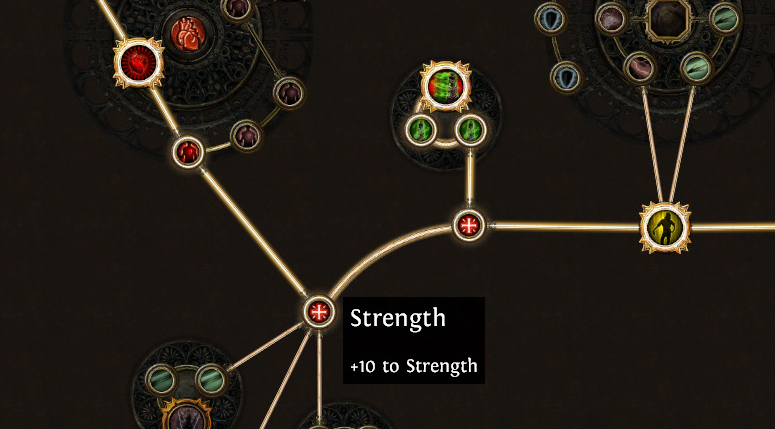 Attribute nodes give +10 to either strength, intelligence or dexterity and make up most of the spiderweb that connects the different clusters of the tree. As you move from one area to the next you gain attribute points en passant providing an ample supply that’s, while not quite enough for most builds, a good basis that can be increased further by bonuses from your equipment. 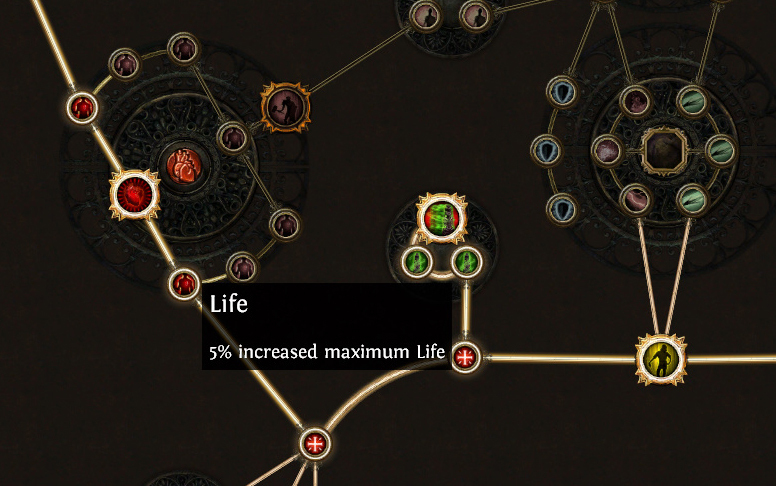 Basic nodes give simple bonuses like ‘5% increased maximum life’, ‘8% increased physical damage’ or ‘20% increased critical strike chance’. Most clusters consist of multiple basic nodes that are either identical or at least follow the same theme. The centerpiece of most clusters is a Notable, which gives considerable stronger bonuses than the basic nodes leading up to it. 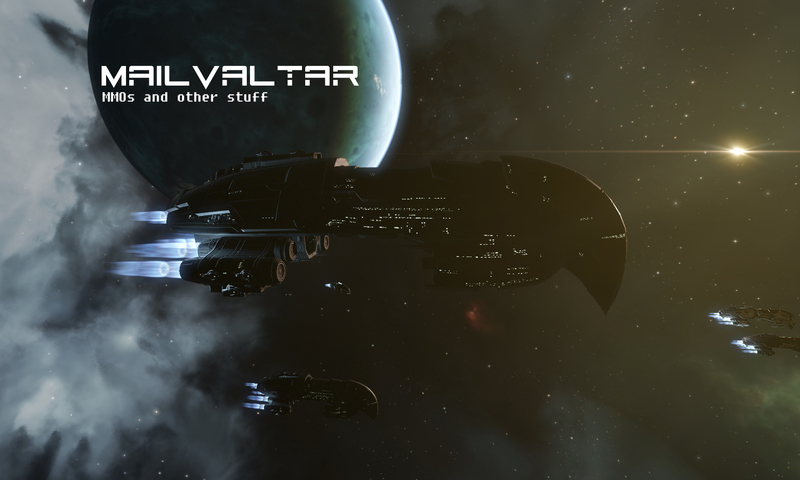 It’s almost always worthwhile to invest enough points to reach the Notable. Rather than giving simple bonuses, Keystones grant special abilities or fundamentally change how specific things works, for example ‘Life regeneration applies to energy shield instead of life’. To make up for the advantages a build gets from them there’s also a drawback attached to most. 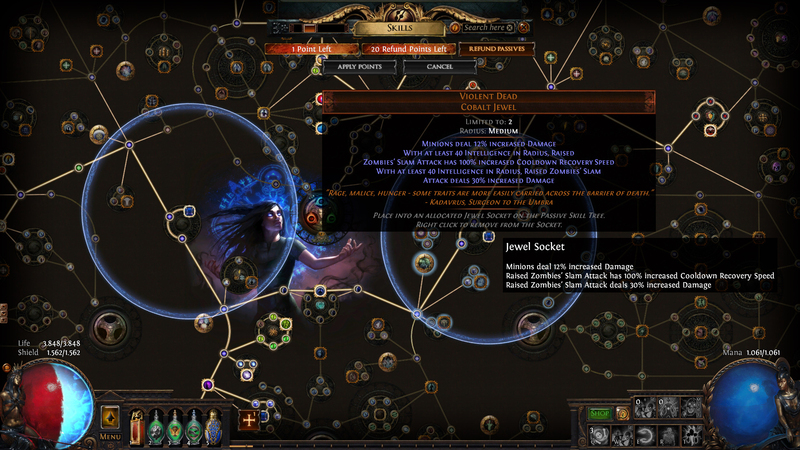 Lastly there are nodes that do nothing by themselves, because they are sockets meant for placing jewels into. Jewels are dropped items that come in different flavours and can be quite powerful (a perfectly rolled rare one would probably be stronger than most top tier Notables). There’s also unique jewels. Some of those have a radius and affect some or all nodes inside that radius in one way or another, providing some more interesting possibilities. When planning a character you basically decide which Keystones, Notables and jewel sockets you want to get and build everything else around that, making sure that you have enough attribute points, damage output, hit points and mana in the end. At the same time you can offset weaknesses your gear might have, with the option to respec a couple of points later when you’ve got better items. 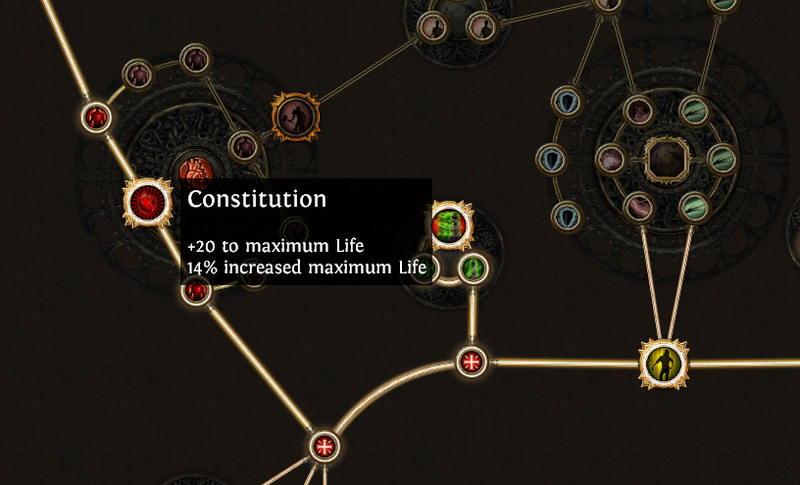 I haven’t felt that much freedom (and also power-gain) when allocating points in any other skill tree. To me it’s the mother of all skill trees. PoE has a pretty clever approach to it’s ‘endgame’. When you finish the story by beating the boss at the end of Act 10 your character should be somewhere around level 70. The highest level areas in Act 10 are level 67, so in theory you could grind those zones for leveling over and over for quite some time before XP gains would slow down too much. That’d be boring as hell though. PoE’s answer to that: Maps. Maps are items that can be used to open a high level area with random layout full of mobs including a boss. They can have mods that ramp up the map’s difficulty while also increasing the rarity and quantity of loot-drops. 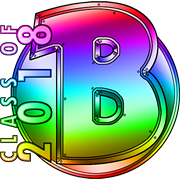 There are 16 tiers of maps, with monster levels (and corresponding difficulty) ranging from 68 to 84. They are consumed upon use, so building and maintaining a pool of high tier maps is a constant challenge. Back when this was all there was to it ‘just’ running one map after another started to bore me pretty quickly though, to me it didn’t feel that much different to running the same areas over and over in Diablo II. In 2016 GGG introduced the Atlas of Worlds. This made a hell of a difference for me. 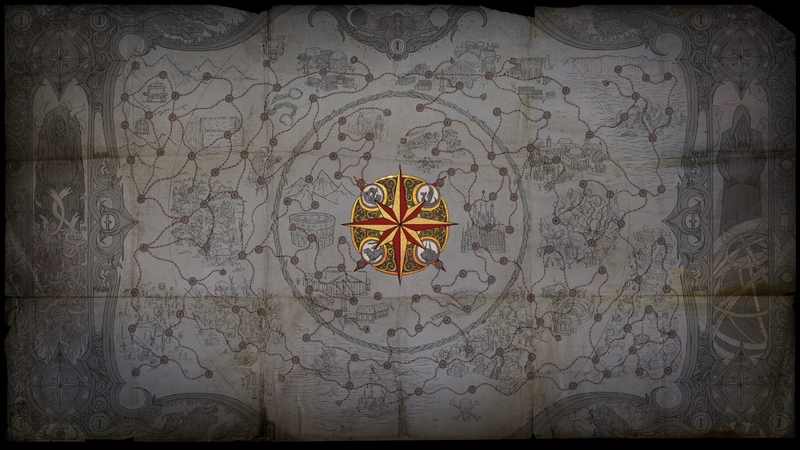 The Atlas is basically a map of all existing maps…which sounds a bit weird, but there you go. When you beat a map (by killing it’s boss) for the first time you mark it as completed on the Atlas and the next tier is revealed. Thus you slowly work your way from the corners of the Atlas towards the center, where your final challenges await. 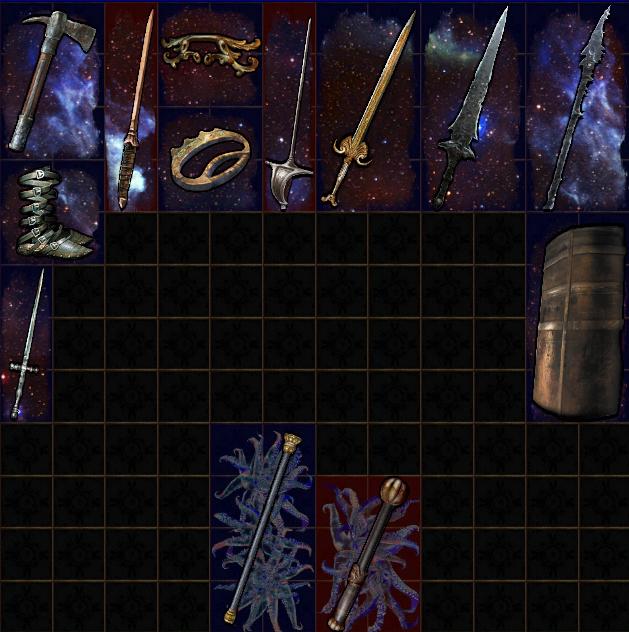 The biggest draw for me are the Shaper and the Elder though. These very powerful beings are constantly at odds with each other and both try to take control over the Atlas and the worlds therein. When you complete a map controlled by either entity you free it from it’s influence, and under specific circumstances the other takes control over it. It’s a constant back and forth, also depending on if you have the right map at hand when you need it. 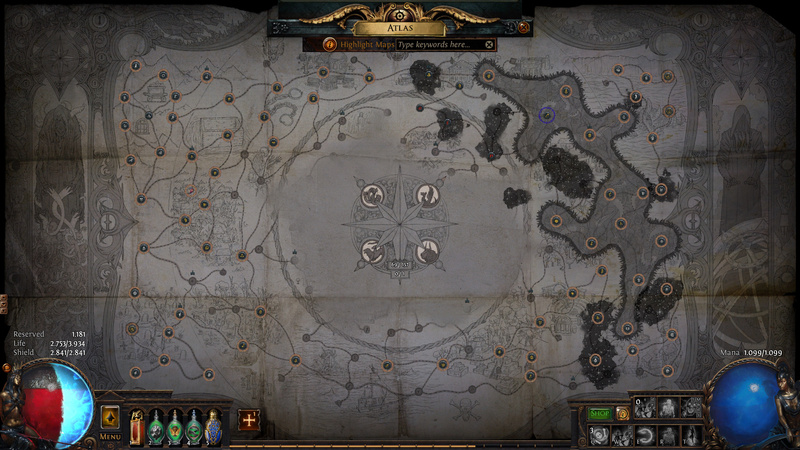 The final goals are to reach the center of the Atlas and fight the Shaper, and help the Elder to expand his influence, then fight him too (of course). 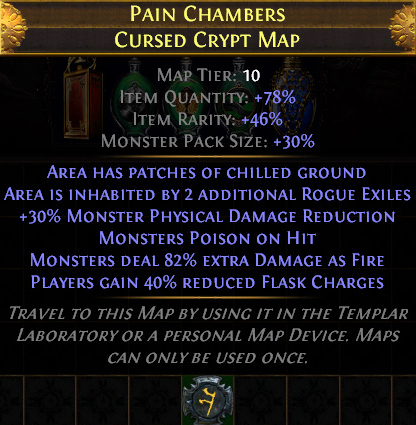 Elder- and Shaper-controlled maps can also drop loot with special properties, which makes running such maps even more desirable. The Atlas has added much depth and variety to the Map-system. It also has that ‘just one more’ feel to it now and, to me, never gets boring. Next PostNext Blaugust Reborn is here, and I’m in!